Earrings adorn the ears beautifully in a woman. Earrings are those elegant pieces of jewellery worn on the lobe or edge of the ear. The most beautiful accessory for a woman for that gorgeous look is set of lovely earrings. Designer earrings are a notch higher for that designer feel and look in them. Purely designed in class, beauty and amazing designs, these designer earrings are an eye catcher. 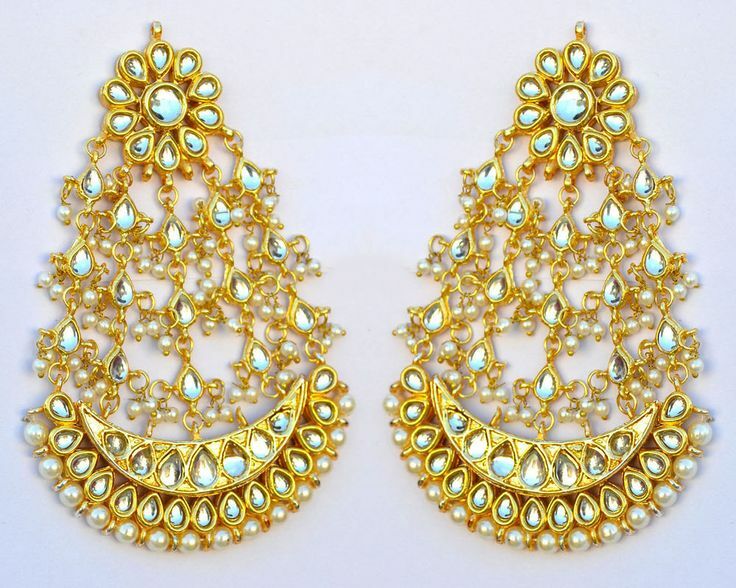 Great artistic designs, usage of expensive stones and other embellishments, these earrings are worth the price one pays. The mesmerizing designs in these earrings make them worth wearing even as standalone piece of jewellery. Woman wearing gold jewellery looks beautiful in all ways. Just designer gold earrings can transform the look of a woman in an entirely different way. These are pure gold earrings designed with elegance and crafted with a designer perfection in them. These are unique in the designs and the designs are also such that they can be perfect for any special occasion. Gold designer earrings can never be wrong or can never go out of fashion. Designer silver earrings look beautiful in appearance and looks. The plain sterling silver earrings can get the designer feel with expensive stone embellishments or sparkling stones studded on them. 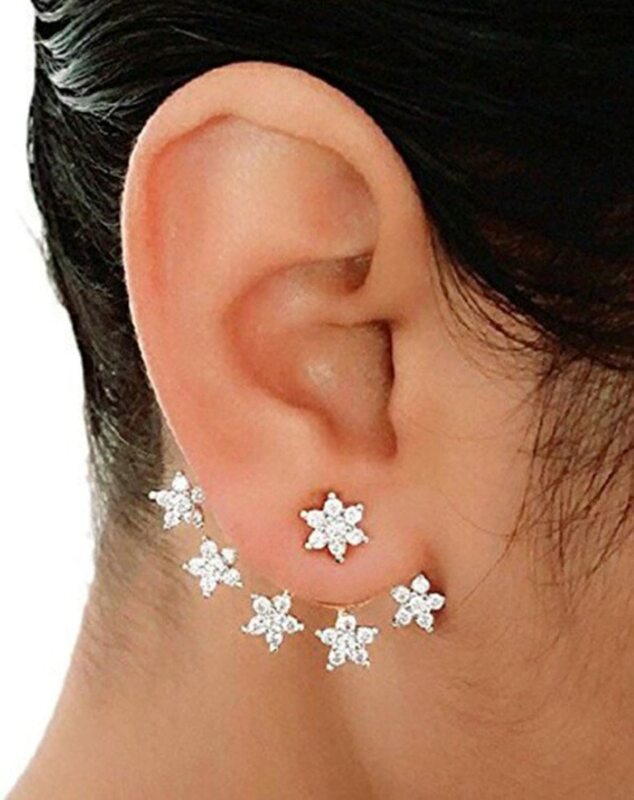 Silver earrings in sterling silver have a particular shine in them and every piece is unique in the design and these designer silver earrings stand out when accessories with the right outfits. It is a designer stud earrings. A designer stone earring in bright and white stones with different colors with the matching teardrops looks beautiful as ethnic jewellery and is perfect for ethnic wear. 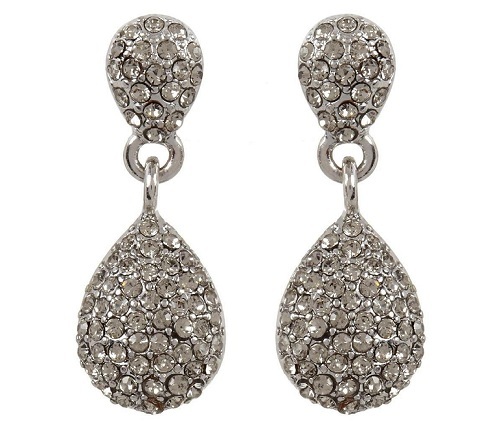 Teardrop earrings are very much part of designer jewellery. The unique designs and the beautiful stone work in a perfect pattern make these designer earrings very much desirable by women. 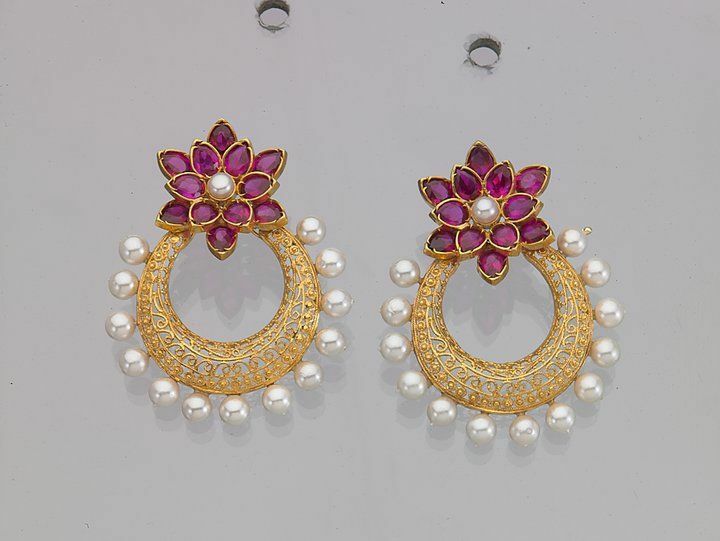 Jhumkas are the most important in any designer jewellery designs. They look amazing in traditional wear and ethnic wear. The traditional umbrella design of the jhumkas in gold, silver, oxidized metals or in antique finishes give a designer look to the earrings. 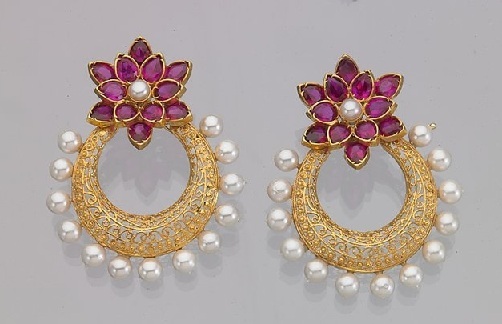 The designer jhumkas can be with expensive stones, pearls, flower motifs and other unique embellishments. Filigree work is very much in vogue for fashion and designer jewellery making. Filigree is fine metal wired work or a trace pattern used in various accessories. 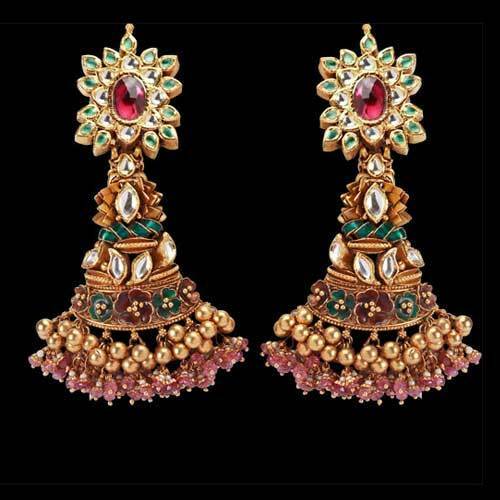 This is a very intricate work and hence looks beautiful on chandelier earrings. 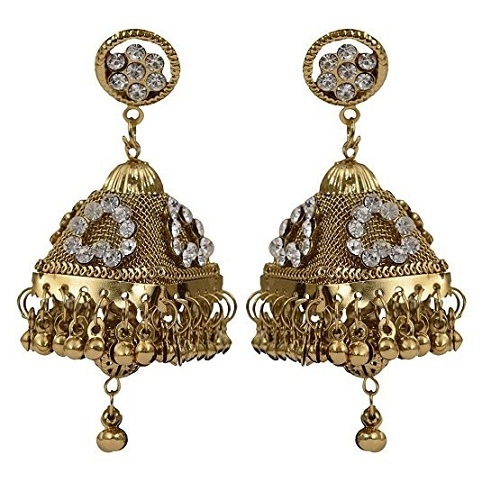 Chandelier designer earrings are long and hence the filigree work does justice to the earring. 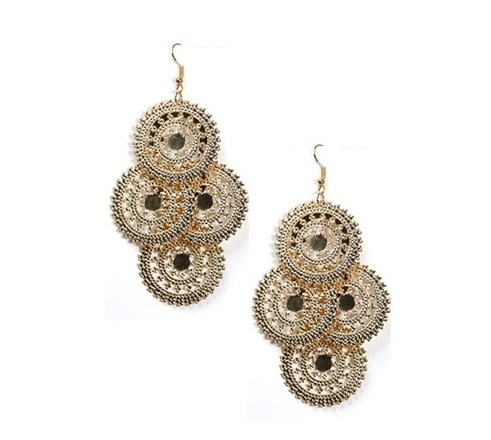 Filigree earrings with gold and sterling silver gives a beautiful yet contemporary look to a woman. 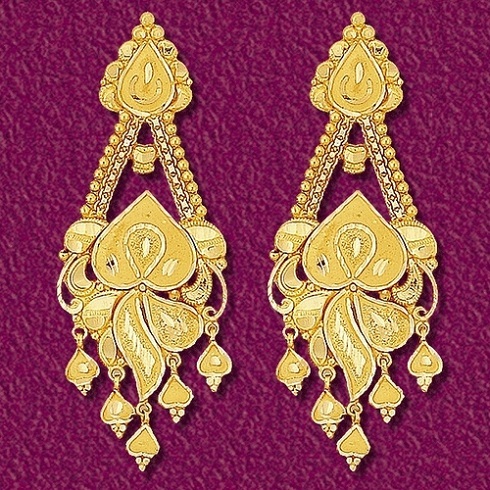 These pure gold and diamond hanging earrings are just breath takingly stunning in looks and design. 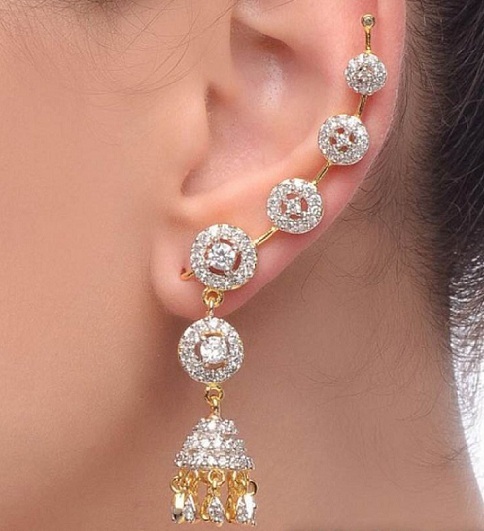 The earrings in designer finish with diamonds and a small jhumka on the downside but for the ear lobe these have stunning diamonds fitted perfected in an arch to give that designer element to the earrings. 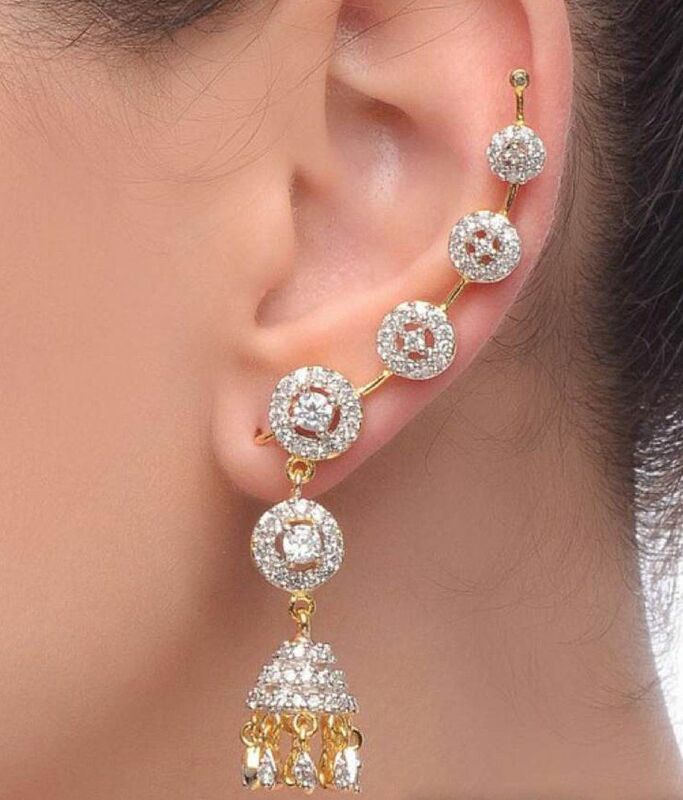 The whole earring looks different and has a fresh, designer feel to it. What can be more beautiful than sporting something in an accessory which is handmade? 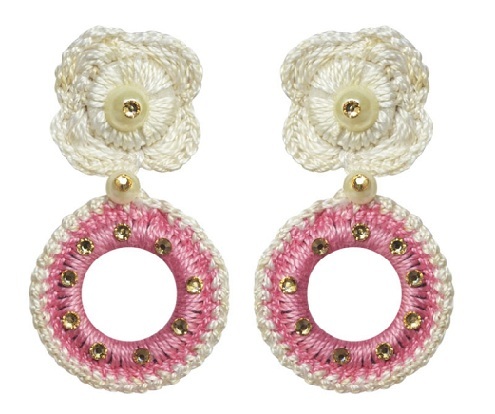 These designer earrings are handmade and come with a beautiful crochet work in color hues of white and pink with stone work in between. These handmade earrings are in floral pattern and look really pretty. 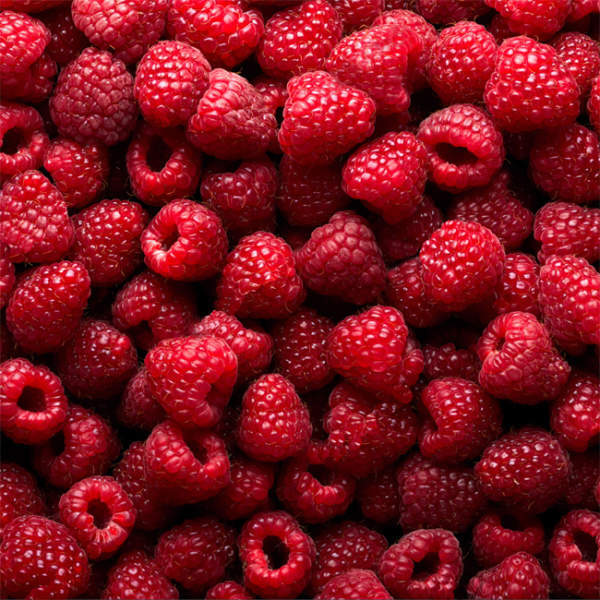 Talking of designer things and can rubies be left behind? 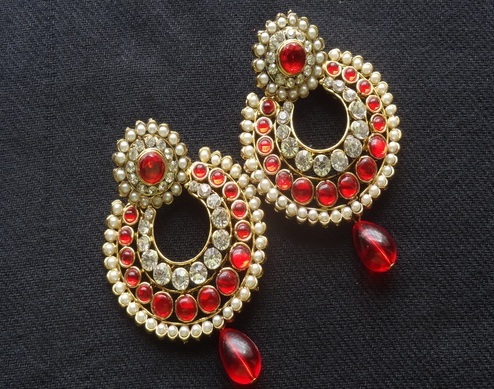 Rubies in designer earrings are classy and look beautiful. These chandbali (moon design like earring) style earrings are perfect for a traditional evening function. These baalis in gold with precious rubies studded in perfect pattern with pearls around the moon pattern give it a designer feel. 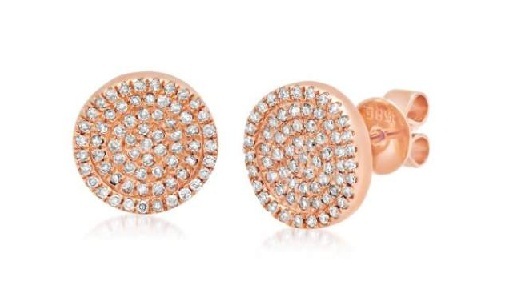 Diamonds in rose gold look elegant and have a designer feel to the earrings. Rose gold with an alloy of copper and gold gives a pinkish or reddish color tone to the jewellery and looks really classy and rich. These diamond pave studs in rose gold with brilliant and shiny diamonds are perfect for classy formal dinners or formal evenings or parties. Birds are symbol of freedom and their wings are which take them to new heights and places every single day. They are the master of what they want truly, free and independent. Women have both these qualities of birds. 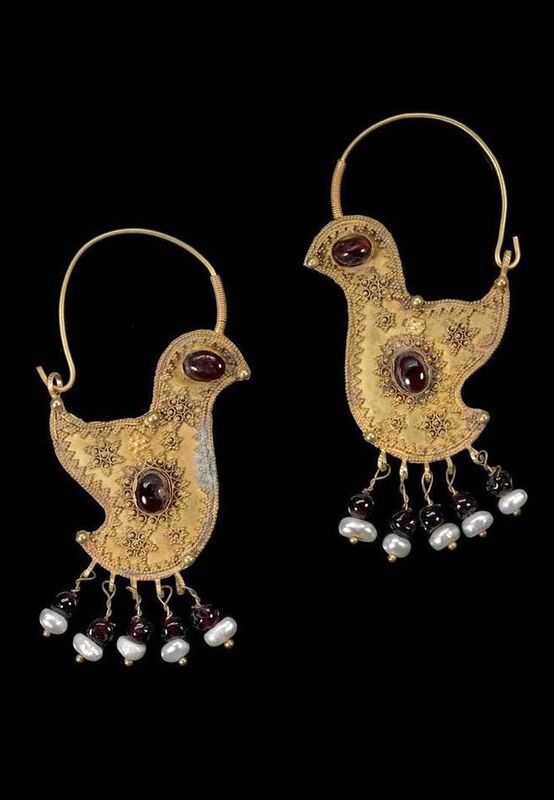 These bird hoop designer earrings are inspired from designs of Persian and are a designer reflection of Persian art and craft. These are truly made in a designer fashion exclusively for a bride. 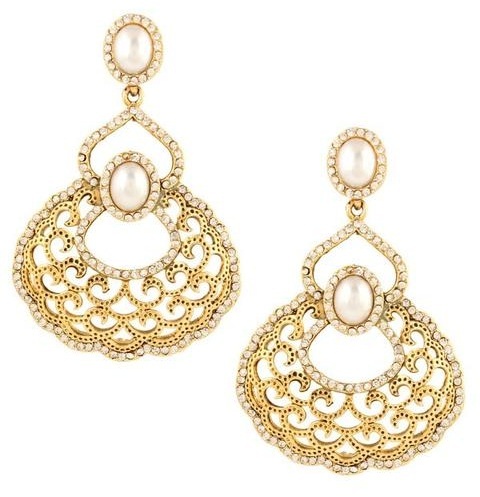 These are in pure gold with pearls. They are heavy and long and perfect for bride to match with her traditional bridal outfit. Shades of gold and golden are perfect for weddings and hence these designer earrings are apt for any bride on her special day. Peacock designer gold earrings have a pure traditional look to be paired with any ethnic or Indian wear. 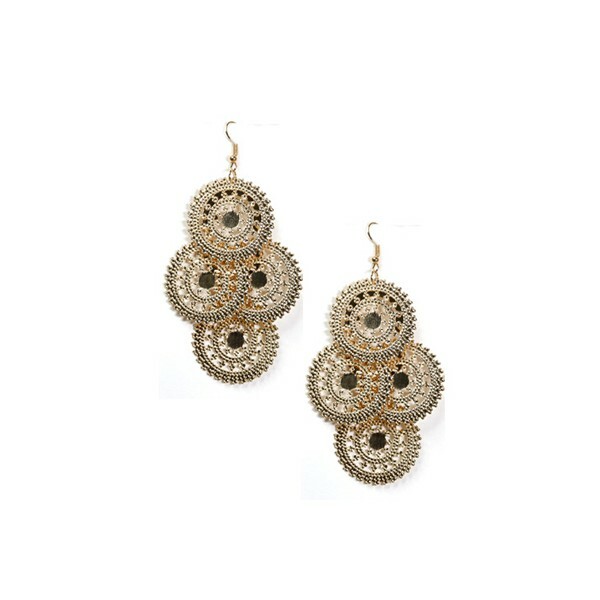 These heavy earrings can be perfect for a bride too. 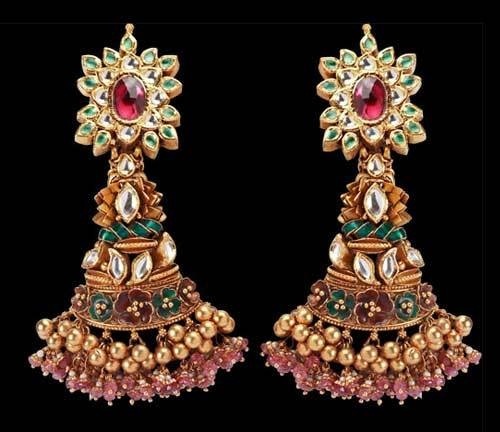 These pure gold earrings with expensive stones in traditional Kundan work with peacock designs as embellishments in multi colored hues give a brilliant gorgeous look to a woman. 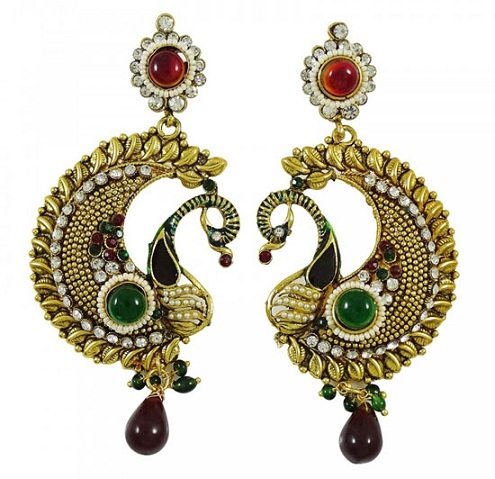 These Kundan earrings are elongated to capture the designs and colors of the silver peacock beautifully and in an artistic way. Multicolored dangling earrings look brilliant and freshly designed. Designer teardrop or chandeliers in multi colors look brilliant for any outfit. They have intricate work done in long designs and have a great gorgeous appearance on a woman. Anyone can carry off these lovely looking multi colored designer earrings in style. Antique and designer are two lethal combinations for any jewellery. Combining them into one earring will give a beautiful masterpiece in jewellery. 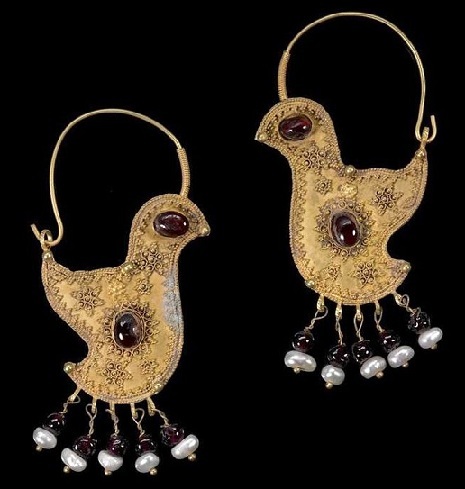 Antique; gives that perfect design and value to the earring with unique designs and patterns and with the designer elements the value of antique jewellery just increases. Perfect for bridal wear or as a traditional wear. Cuff earrings are a trend now sported by girls and teenagers. 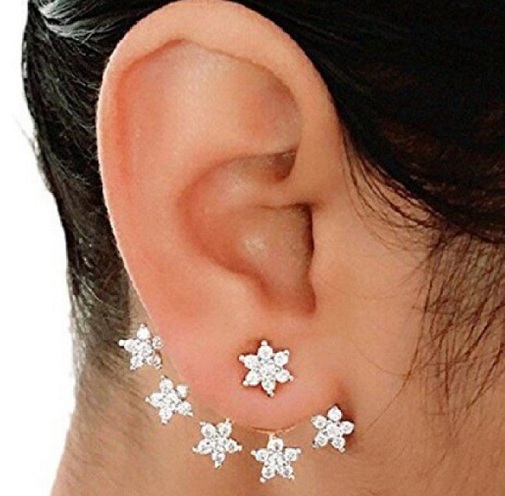 Perfect for the young people, are these star/floral motif inspired diamond cuff earrings. They are not very over the top but still have a designer look and feel to them and it is an easy to carry look for the young girls out there who want to experiment with their looks. Designer is the in thing these days with everything getting designer every-day. From sarees, watches, jewellery, accessories etc. designer elements are fast catching up. Earrings are also not left behind. Designer earrings are fast moving as a jewellery trend. These are perfect and custom made for various occasions and one can choose accordingly. The varied designs and patterns in these designer earrings can spoil one with the confusion for choosing the jewellery. 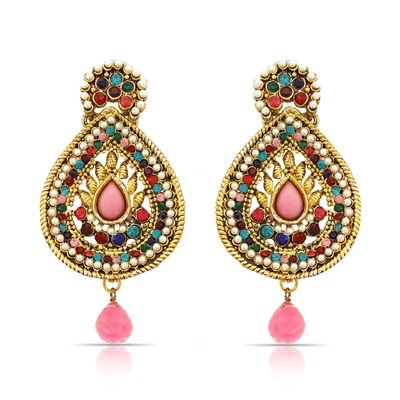 Pick according to your requirement and taste and flaunt these beautiful designer earrings.